We are organizing the 1st International Workshop on Internet of Autonomous Unmanned Vehicles (IAUV 2019) in conjunction with IEEE SECON 2019 – IEEE International Conference on Sensing, Communication and Networking. The workshop will be held in Boston, MA, USA, on June 10th, 2019. The submission deadline is March 15, 2019. For details, please visit https://iauv2019.loria.fr/. Selected authors will be invited to submit an extended version of their works to the MDPI Special Issue on « UAV-Based Applications in the Internet of Things (IoT) ». The special issue submission deadline is on July 15th, 2019. 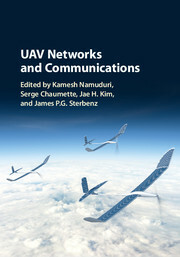 UAV Networks and Communications, Cambridge University Press, edited by Kamesh Namuduri, University of North Texas, Serge Chaumette, Université de Bordeaux, Jae H. Kim, Boeing Research and Technology, and James P.G. Sterbenz, University of Kansas is available for Pre-order. This is the first book to focus on communications and networking aspects of UAVs. It covers the foundational concepts of the topic, as well as offering a detailed insight into the state of the art in UAVs and UAV networks, discussing the regulations, policies, and procedures for deployment (including analysis of risks and rewards), along with demonstrations, test-beds, and practical real-world applications in areas such as wildlife detection and emergency communications. Samira Hayat and I have co-authored the chapter entitled “Aerial Wi-Fi Networks“, which identifies the characteristics of aerial links and communication requirements for an aerial network. A special focus is given to IEEE 802.11 (Wi-Fi) technologies due to their wide availability in current networking devices, their suitability for small UAVs, and the extensive research dedicated to them in the past decades. We report real-world measurements for multi-hop aerial Wi-Fi networks and discuss the feasibility of this communication technology to deliver the required quality of service for several potential applications. Our survey entitled “Survey on Unmanned Aerial Vehicle Networks for Civil Applications: A Communications Viewpoint” is accepted in IEEE Communications Surveys and Tutorials. This comprehensive survey reports the characteristics and requirements of UAV networks for envisioned civil applications over the period 2000–2015 from a communications and networking viewpoint. We survey and quantify quality-of service requirements, network-relevant mission parameters, data requirements, and the minimum data to be transmitted over the network. Furthermore, we elaborate on general networking related requirements such as connectivity, adaptability, safety, privacy, security, and scalability. We also report experimental results from many projects and investigate the suitability of existing communication technologies for supporting reliable aerial networking. We have tested our multi-UAV system for a search and rescue scenario, where we have demonstrated the planning, communication, and detection capabilities of the aerial network. Once the target is detected, a communication relay chain is formed from the UAVs to the ground station, streaming real-time video of the target. See the video of the demo here. Our paper “Information Exchange and Decision Making in Micro Aerial Vehicle Networks for Cooperative Search,” is accepted for publication in accepted in IEEE Transactions on Control of Network Systems. The article considers a network of autonomous micro aerial vehicles (MAVs) cooperatively searching for multiple stationary targets, with the objective to minimize the search time while considering sensing and communication limitations. We explore and classify the design options in multi-MAV cooperative search in two dimensions: information merging and decision making where each dimension can be either centralized or distributed. Algorithms are then introduced to analyze the effects of centralized or distributed coordination for minimizing the search time. We show that depending on the availability of information and capability of making decisions, the MAVs can search an area more efficiently if both information merging and decision making are distributed.